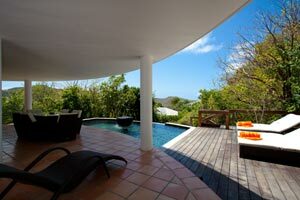 Villa UJV 341, also known as Ananda, is nestled into the cliffs of Liz Claiborne's former estate in St Jean, St Barts. This brand new 2 suite villa is perfect for relaxing and secluded, romantic get-aways. Just minutes from the beach, restaurants, and shopping in St. Jean, but far enough away to find peace when desired. The main living area is about 1,500 square feet with a curved glass wall offering sweeping views of the lush green hillside. Villa UJV 341 is furnished with contemporary sofas and tables, as well as modern technological amenities The kitchen is open to the living area and is fully-equipped with a professional stove and beautiful granite counter tops. There is also a grill and dining table on the outside patio. Outside you will find the pool that waterfalls into the 8 person Jacuzzi. Steps leading down from the Jacuzzi take you to a lower parking area. Up from the main pool deck there is a peaceful cave area that holds a 6-foot round Granite tub where you can relax with nature. For total privacy, Villa UJV 341 has two suites located on the top level. The suites are 900 square feet and feature king size beds, en-suite bathrooms with large granite soaking tubs and private decks where you can sit quietly and read or simply take in the breathtaking views. A third bedroom with a queen bed, complete with an outside shower, is located on the lower level off of the kitchen, it is ideal for children traveling with a nanny.